After being home three days after a nine day trip to Southern California, Mr. Fanatic, our youngest daughter and I headed off to one of our favorite weekend destinations, Savannah, Georgia. Savannah is such a great little town with cute shops and so many awesome places to eat. One great thing about Savannah is that you can park your car in the hotel garage and leave it there until it's time to go home because you walk everywhere since everything is so close. You can always count on the Paris Market for some inspirational tablescapes. I love how each setting on this table is unique. All of the dishes, flatware and glasses were vintage pieces. Another tablescape at the Paris Market displayed a Spring look. The vintage china on a round glass table reminded me of one of my grandmother's sets of china. Another wonderful shop in Savannah called Villa Savannah displayed a whole slew of Spring accessories on on of their tabletops. I love all the glass and wire cloches and the tall vases overflowing with Easter colored flowers. As I look at this photo I'm wondering why I didn't buy a few of the cute little glass cloches. There is so much more to see from our trip to Savannah. Will be sharing more in the days to come. Be sure to follow along if you don't already so you don't miss it. I love going to that store. So many pretties. I would love to sit at any one of those pretty tables. Those are beautiful table scapes Pam. I love the one with the watering can centerpiece! I know I would absolutely love this store, Pam. 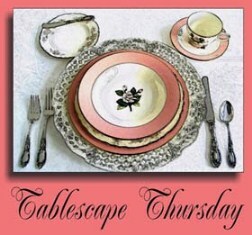 Gorgeous tablescapes! Thank You for the tour! Beautiful tables! I have never been to Savannah. I guess I need to take a trip! Thanks for sharing. Oh, my. I love Savannah. I would love to make another trip there. I just noticed that we are practically neighbors. I am just south of you in Lancaster. Thanks for stopping by Dogs and Grandkids. Thanks for sharing all the Savannah tables. I love visiting there. I know Paris Market well they always have such creative displays and windows. That spring table is lovely. When we first married Joe owned a house down on Henry St., near SCAD. We used to drive down to Savannah all the time but after he sold that house we do not go anymore. I am a fan of Charleston, S.C. too. Gorgeous!! Would love to shop in that last store! I think my wallet would suffer greatly at those places! I love the fact that they decorate the tables which stimulates your mind! The tall vases with the flowers looks so spectacular. I've only been in Georgia enough to pass through on our way to Florida. I need to go there and stay a while! Thanks for sharing...looking forward to more! I LOVE Savannah! I've been to Paris Market, but not to the other store. Did you go to One Fish, Two Fish? That's a nice one, too! I bet it is beautiful this time of year. Home Goods has some nice cloches now. Maybe you could find one there. I love that flower arrangement for spring! I love the spring look from the Paris Market and the pictures from Villa Savannah. Beautiful! I'm so glad you had a fun time there. Oh my! What a wonderful trip! Those stores are fabulous, full of such beautiful things! I just love the table set with vintage mixed and matched dishes, each place different. And I love the tbale with all the cloches and spring stuff! Happy Spring! Your photos from here are amazing! Loved that place!